LEONARDTOWN, Md. – January 26, 2018: On January 18, 2018, the Leadership Southern Maryland (LSM) Class of 2018 participated in the fifth of nine educational sessions for the 2017-18 LSM Executive Program – Healthcare. Sponsored by The Chesapeake-Potomac Healthcare Alliance, this one-day event began with the class participants visiting one of the three hospitals in the region – CalvertHealth Medical Center, University of Maryland-Charles Regional Medical Center, and MedStar St. Mary’s Hospital – for an in-depth brief of the hospital, its capabilities, specialized types of treatment/service lines offered, and a walking tour of the facility. By mid-morning, the classmates met at Walden Behavioral Health’s Anchor Treatment Center in Charlotte Hall where they were welcomed by Executive Director Dr. Kathleen O’Brien. After a tour of the treatment center, Dr. O’Brien briefed the class on substance abuse and the impacts it has on those who suffer from the disease, their families, and the community as a whole. Her presentation was followed by personal testimonies from people undergoing treatment who were willing to share their life experiences. At the conclusion of the testimonies, the participants transitioned to the Charlotte Hall Veterans Home in Charlotte Hall. They began the afternoon with an informational session on current issues in healthcare presented by Mike Robbins, senior vice president for the Maryland Hospital Association. This was followed by a tour and overview of the Charlotte Hall Veterans Home. The class also learned of Melwood’s Operation Tohidu, a program that is helping veterans who suffer from post-traumatic stress. The day concluded with a panel discussion on public and community health issues facilitated by Tony Jones LSM’16, public information officer for St. Mary’s County. The panel members, Dr. Dianna Abney LSM’15, Charles County health officer, and Dr. Meenakshi Brewster, St. Mary’s County health officer, answered questions about challenges facing local healthcare departments, the opioid crisis, and what keeps them up at night. 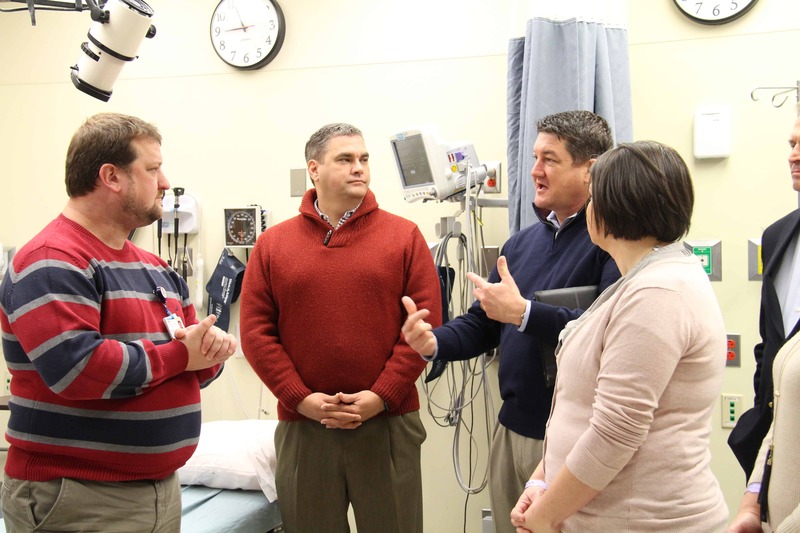 Following the discussion, Dr. Abney, conducted a certification course on administering naloxone, which blocks or reverses the effects of opioids. After the official program ended, members from the Class of 2018 reconvened at Tequila Cantina and Grill to attend an After Hours Social hosted by LSM’s Alumni Association, giving them an opportunity to go over the day’s events and decompress from a session that was both thought-provoking and impactful. The day’s success can be attributed to Dr. Rebecca Bridgett LSM’14, county administrator for St. Mary’s County, and Tony Jones who gave their time and talents into planning the day’s agenda. The support and hospitality of the staff at the three regional hospitals, Walden Behavioral Health, and Charlotte Hall Veterans Home were also instrumental in making this class session both educational and inspiring.